…What in the world would possess innkeepers to open up their homes to strangers 365 days a year? These questions and others answered as Sedona Monthly steps inside five area B&Bs. 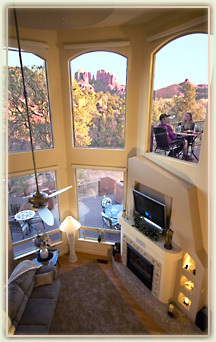 …What is it about Sedona bed and breakfasts and B&B owners that make this town stand out above all the rest? To put it succinctly, if you are drawn to Cathedral Rock and the iconic Red Rock Crossing, there’s no other property in Sedona with better views than the tucked away Sedona Cathedral Hideaway. And if you’re the type of traveler who likes to make friends on vacation, or just revels in being pampered, than owners Larry and Kathy Jaeckel will win your heart. The couple finished building Sedona Cathedral Hideaway, TripAdvisor’s fourth highest rated B&B in Sedona, in August 2006 and opened to guests in October the same year. Larry says he and Kathy designed the house using a $40 computer program, and they designed it to be a B&B at the urging of their realtor. The story goes a little something like this: Twenty-three years ago, Kathy belonged to a meditation group in Chicago. 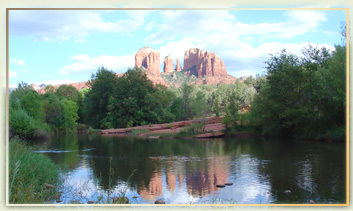 She asked to be shown a vision of where she’d end up, and in her mind’s eye she saw a lot in Sedona. She spent years flying out to Red Rock Country and hiking, searching for the vision she’d seen. She met Larry in 1994 and, shortly after the couple decided to get married, she brought Larry to Arizona. When Larry retired from his position with the Illinois Department of Corrections, they moved to Gilbert and continued to search for Kathy’s Sedona lot. When they found it, Kathy says she cried. The next step was making a living in a tourist town. The Jaeckels’ realtor suggested a B&B and the couple jumped in with both feet. Sedona Cathedral Hideaway, a five-minute walk from Red Rock Crossing, only has two rooms, the Evergreen and the Safari, ranging from 700 to 1000 square feet. The list of amenities is a mile long. Each room has a flat-screen TV, walk-in closet, refrigerator, microwave, two-person jetted bathtub and separate shower, humidifier, warming towel rack, gas fireplace, private phone line and hidden wall speakers for playing your iPod. Kathy, a licensed esthetician, has a salon on-site for facials and skincare treatments. Maybe it’s because they’ve only been doing it for three years, or maybe it’s because owning a B&B in Sedona has to be better than acting as assistant warden in a juvenile correctional facility, but Larry and Kathy seem to love having houseguests. The breakfast menu includes choices such as a pancake medley, egg pizza and Kathy’s special: a poached egg in a pastry shell with crab and avocado. Guests have their choice of everything, right down to turkey or pork sausage in patties or links. They eat breakfast at a time that’s convenient for their schedule and have the choice of dining outside, in their room or in the indoor dining area. Larry and Kathy do all the cooking (and all the cleaning). Afternoon snacks can include anything from fresh soup to homemade ice cream – it all depends on the guest.